Abstract: Compared to the chaotic irrationality of guilt, retribution aims to be reason itself, measure, order (cosmos). But – as I try to show in this paper – if retribution claims to be essentially rational, it is not necessarily intelligent, and that for three reasons at least. First, because of the radical impossibility of measuring guilt. Second, because a sanction cannot restore the order cancelling the disorder produced by guilt. Third, because the other order of human relations paradoxically requires a certain disorder. KEY WORDS: punishment, retribution, reason, order, disorder. SOMMARIO: 1. L’impossibile misura della colpa. – 2. La cicatrice del male. – 3. Il disordine e il legame. – 4. 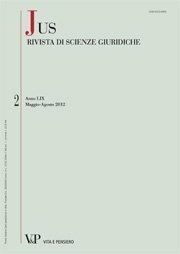 Conclusioni: ordine cosmico e ordine sociale.